Hello, and welcome! This is my entry for Kylie Bertucci’s International Blog Highlights, and you can VOTE for my cards here (I am #41). I would love to have your vote! The theme this month is BABY. 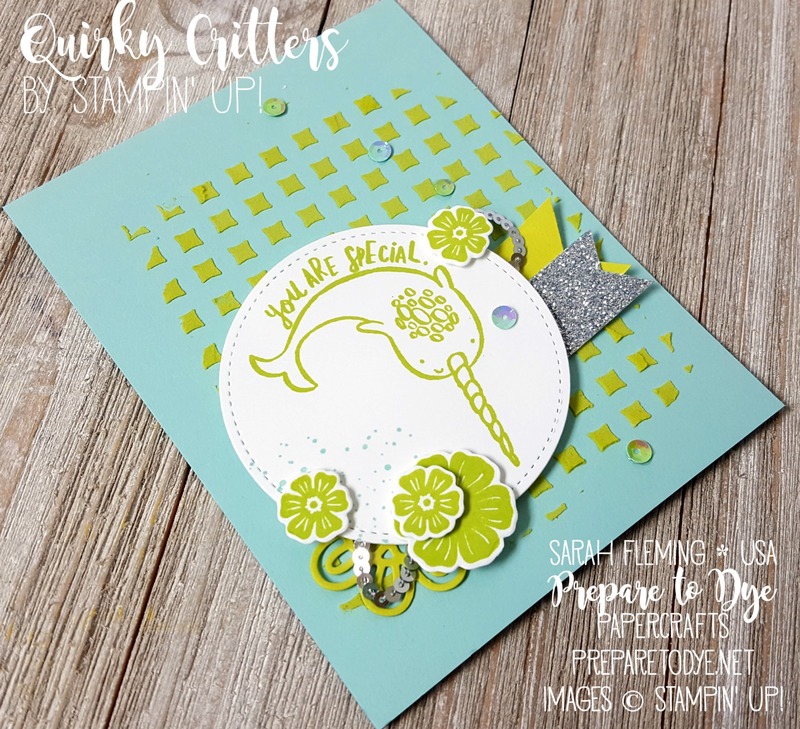 I looked through my baby stamp sets and didn’t feel anything, but then I came across my new Quirky Critters stamp set, and I just had to! I literally squealed in delight when I saw this adorable stamp set in the catalog. It has a narwhal (the unicorn of the sea) AND a sloth! Yep, top of my list. 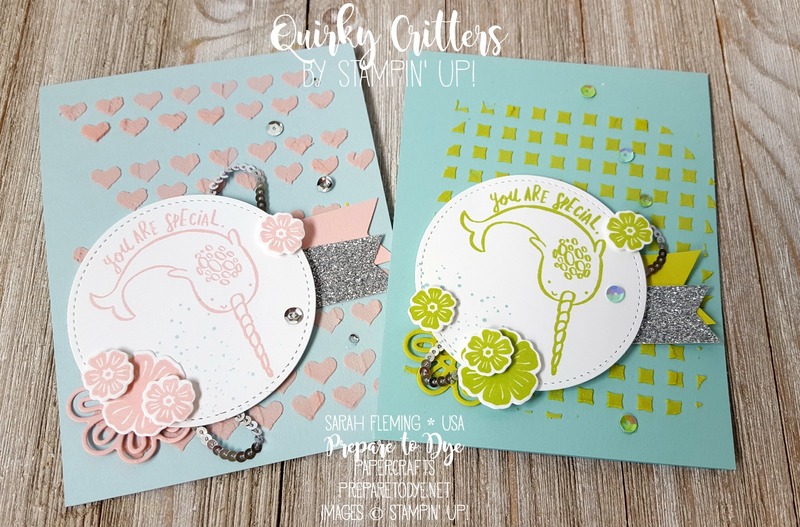 For the background on my baby girl card, I used the new Embossing Paste mixed with Powder Pink ink refill. I love the masks that I have, but I wanted something that said baby, so I made my own mask using a Window Sheet and the strip of hearts in the Mini Treat Bag Thinlits and spread the Embossing Paste through the mask onto the Soft Sky card base. 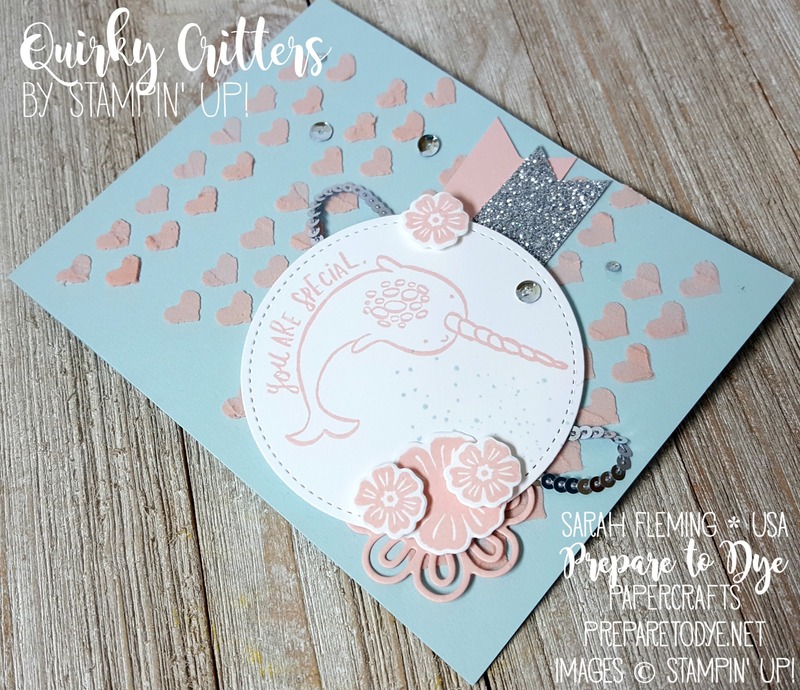 Also in the background are strips of Powder Pink cardstock and Silver Glimmer Paper, some Silver Mini Sequin Trim, and a Powder Pink flower cut using the Support Ribbon Framelits. 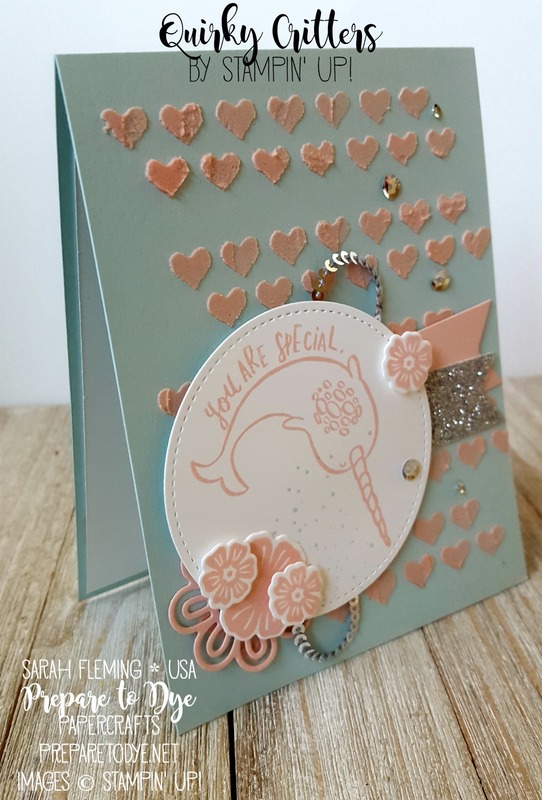 After I stamped and cut my narwhal, I also added some flowers using the Beautiful Bouquet bundle. Finally, I topped the card off with Metallic Sequins. LOVE these! On the inside, I stamped the sentiment from Moon Baby and some more flowers from Beautiful Bouquet. I love when I can use a non-baby set for a baby card! I loved making the card so much that I had to make a boy card to go with it. This time I used Lemon-Lime Twist and Pool Party. And instead of my handmade mask, I used one of the masks from the Pattern Party Decorative Masks. My final change was to use the Iridescent Sequins instead of the Metallics. Soooo pretty! Which one do you like better? I think I’m all for the boy card. Thanks for stopping by, and please go VOTE for #41 in the gallery! 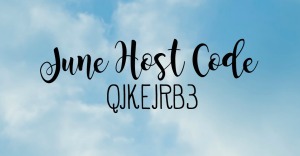 I’d love to participate in the top 10 winners blog hop again! Cute cards! I need that stamp set! 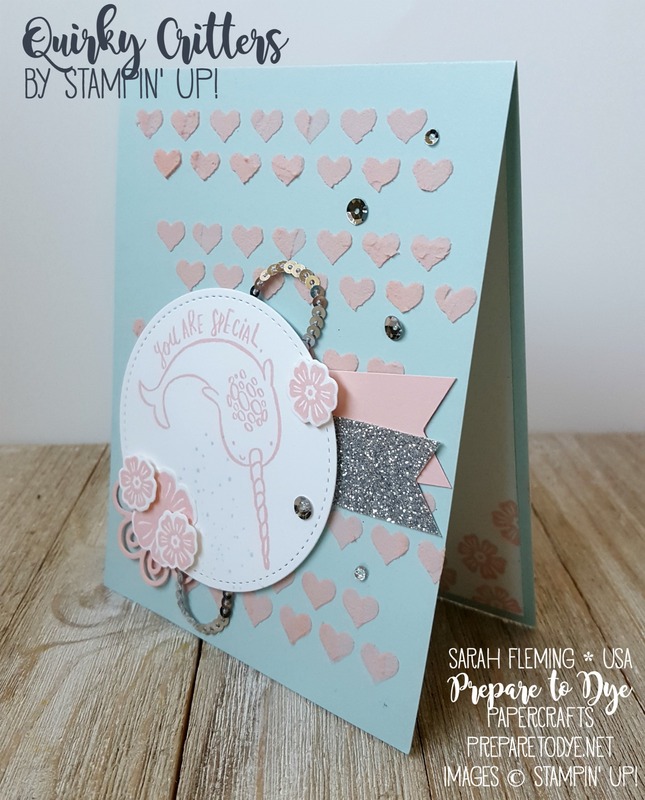 Love your hearts embossing, how much fun is EP? !